Throughout the developing world, millions of schoolchildren lack (or only have limited access to) books and basic learning resources, much less computers or the Internet. Transporting volumes of books or computers to schools can be expensive and logistically daunting. Digital libraries – tablets or computers (PCs) loaded with thousands of e-books and other educational resources – have begun to enhance learning opportunities in the developing world. However, many existing digital library solutions require Internet or power. 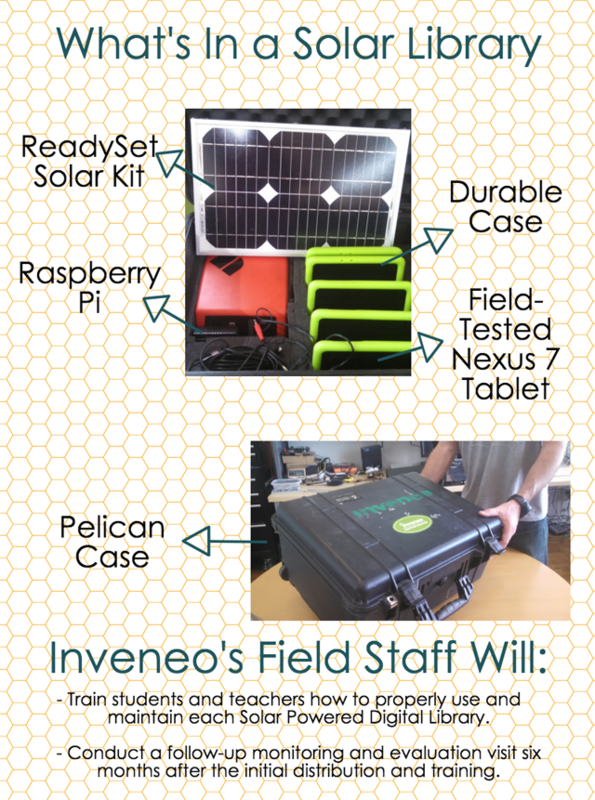 Inveneo’s Solar Powered Digital Library (Solar Library) is ruggedly designed for schools lacking educational resources, Internet, and power. It includes thousands of e-books, lectures, and other educational resources (e.g. Wikipedia) that can be accessed completely off-the grid. Inveneo is no longer fundraising for this project. Thank you very much to everyone who donated to Inveneo to support the Solar Powered Digital Library in the past!